Just over a century ago oil pooled on the surface a worthless byproduct of the earth. The cost of obtaining oil was the effort it took to dip a bucket, basically zero. The discovery that oil provided a source of illumination changed perceptions and extraction began. Depletion of the free oil necessitated drilling in search of energy resources below the surface. The early 20th century marked a paradigm shift in transportation and accelerated the need for energy. Greater demand led to higher prices which made a business case for increased investment. As the easy oil was siphoned off, supply of accessible resources decreased, leading to increased prices, and further investment in deeper wells. Over the past century the oil and gas industry has realized gains through innovation and economies of scale; however, depletion of accessible resources has offset incremental gains in productivity. Spikes in output may lower prices temporarily, but the long-term trend is a global increase in demand for energy and a decrease in availability of hydrocarbon fuel sources. Sunlight hits the earth like a bottomless pool of oil free for the taking. The availability of solar will be constant in the future, regardless of present consumption. The barrier to adoption of renewables has been the cost of harnessing the energy, essentially the cost of the bucket. But renewables also benefit from innovation and economies of scale and, since supply is infinite, the cost of converting renewable resources to energy will always trend downward. A tipping point is approaching. A rising middle class in emerging markets is increasing global energy demand, while at the same time the cost of renewables is nearing parity with traditional fuel sources. It is inevitable that the rising marginal cost of hydrocarbon fuels will intersect with the decreasing marginal cost of renewables; at that point we will see an exponential shift in the energy landscape. The earth has an abundance of free sunlight. Enough energy from the sun hits the planet every hour to satisfy our global demand for a year. Australia’s climate and latitude are particularly favorable to PV. Thanks for leading the charge in harnessing solar energy! Matt – Glad you’re covering renewables! Good piece! Well said and done Matt! Hope all is well. Matt, well and simply stated. Smart and micro-grid power management and sensing/monitoring technologies are what will help us manage and scale renewables in the utility power mix. We’re sloooowly moving in the right direction. Thanks for you contribution. Great Post. I love the references to intersecting marginal costs. This will be the driver. Keep up the good work! Very good post! Some would argue that the tipping point has already occurred, especially when considering the “true cost” of petroleum. Total cost of ownership is an eye opening approach! Absolutely! When you add in the external costs of pollution and the military force required to secure our energy interests in the Middle East we have long since past the cross over point. Unfortunately the true cost of energy is not reflected at the meter, most of those costs are taxed based on income, not consumption, or passed along to the next generation. However, we should not conclude that solar energy could cover all our energy needs and save the planet. PV panels can represent a significant additional source of energy for households or small industrial sites. But the Return On Investment period is still longer than 10 years, even with state subsidies provided in developped countries. Solar energy is only available at full power during a short period of the day. If solar energy would represent a significant part of electricity production, it should be associated with huge and costly energy storage systems, yet to be developped. In terms of energy (let’s say: GWh), in order to produce as much as a 1000 MW power plant (with gaz, coal or nuclear fuel), 50km² of solar panels would be necessary (around 7km x 7km). In addition, we not only need energy to produce electricity. We need also energy for transportation and to run industrial processes. Fossil fuels cannot be replaced. Last point: we also use oil or coal as raw material in chemical industry, for plastic manufacturing for example. There is still a long way before we can skip over Middle East oil or Austrialian coal. If you accept that the long term trend is an increase in the cost of hydrocarbon fuels is increasing and the cost of renewables is decreasing, than the transition from fossil fuels to renewables is inevitable. As long as PV is more costly other forms of energy generation it takes subsidies to encourage adoption. At some point PV will be less expensive and subsidies will no longer be necessary. 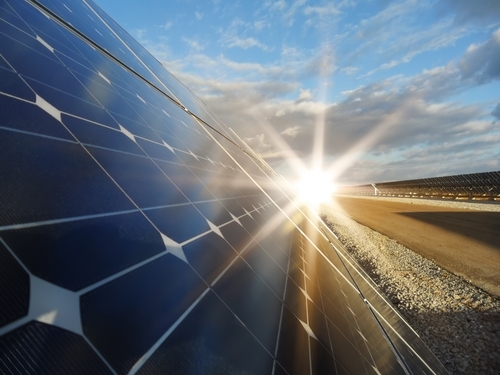 NREL is shooting for Utility-Scale solar generation for $0.06/kWh by 2020. Personal transportation has already started the shift towards EV or hydrogen. EV can also serve as energy storage on a micro-grid, and hydrogen can be generated using PV. We have plenty of 5mi blocks of desert in the SW US that would be great locations for 1000MW solar power plants. And you are correct we will always need some oil and coal, just as there will always an application for horses and 35mm film. I do think that renewables will overtake fossil fuels in my lifetime, with a tipping point in the next 10-15 years where the majority of new generation has made the switch. This is not a question of optimism and pessimism. We all hope to benefit from renewable sources of energy, as much as possible, as soon as possible. I just want to remind that solar PV is just one brick of the puzzle, and will remain a small brick for the near future. As mentioned by President Obama in the 2014 State of the Union address, natural gas is one of the reasons of the booming economy and energy independence of the USA. Even if low gas price may delay the emergence of PV, it is a good news. Well stated. The entry cost for the consumer has decreased over the years with government subsidizes but it still requires out of pocket expenses for a slow ROI. I am excited about having teams that support Solar and in some ways EV. I am encouraged this year could be a big year for Schneider Electric on that front with the new XCNA product. Time will tell. Thank you for the invite to read your blog. Matt, very nicely written. The sun is the source and so it makes sense to take the fastest route to a cleaner option. I’m optimistic that necessity is the mother of all invention and therefore, if the tipping point forces the planet there faster, so be it. Matt, great read and agreed. I’m seeing solar becoming extremely popular in California. Solar is the way for future generations who want to optimize free renewable energy and save our planet. Thanks for sharing. My apologies but would you be able to repost your comment in English please?